Fruit and vegetable carving is a significant part of Thailand’s historical past and has conquered the world as an exemplary form of art. This art dates back to the 13th century and had its origin in Sukothai, now in central Thailand. The joy of carved fruits can be relished at hotels, cruise liners and Thai restaurants across the world. As more people discover the beauty of this unique Thai art a big salute is warranted to the imagination of super chef Nang Noppamart. This ancient tradition known as Kae Sa Luk adds beauty and value to every dish. Carving as an art declined in the early part of the 20th century, so later it was decided to introduce it in the curriculum of schools and colleges. It is taught at primary, secondary and university level as an optional subject. The art made its way to foreign countries and is being practised all across the world. Chefs worldwide use it to improve the presentation of their food. Though traditional Thai carvings are more elaborate on watermelon, incorporating delicate flowers and animal shaped fruit and vegetable carving is a comprehensive domain where everything from basic plate garnishes and simple fruit bowls to edible arrangements and complex multi-piece show platters are attempted. Other than watermelons many smaller fruits are also used in fruit and vegetable displays. They include bananas, celery, beetroot, cucumber, potatoes and taro. Watermelon is one of the most popular fruits for beginners as well as veterans in Thai carving for many reasons. Watermelon gives a lot of working area and has distinct colors of red, pink, white and green of the skin. Fruit carving evolved massively from its simple origins in the street markets to modern restaurants, weddings, resorts and cruise ships. 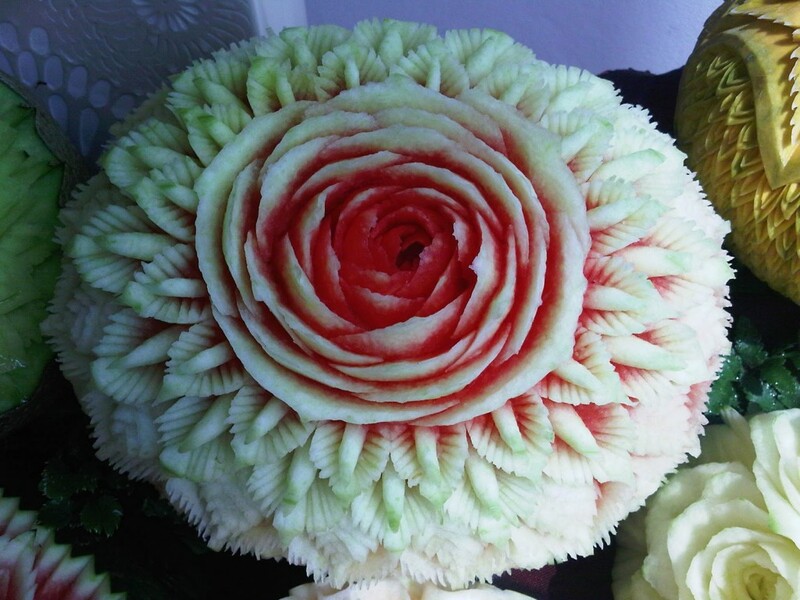 The skill of fruit and vegetable carving is also being spread through courses in the western world. 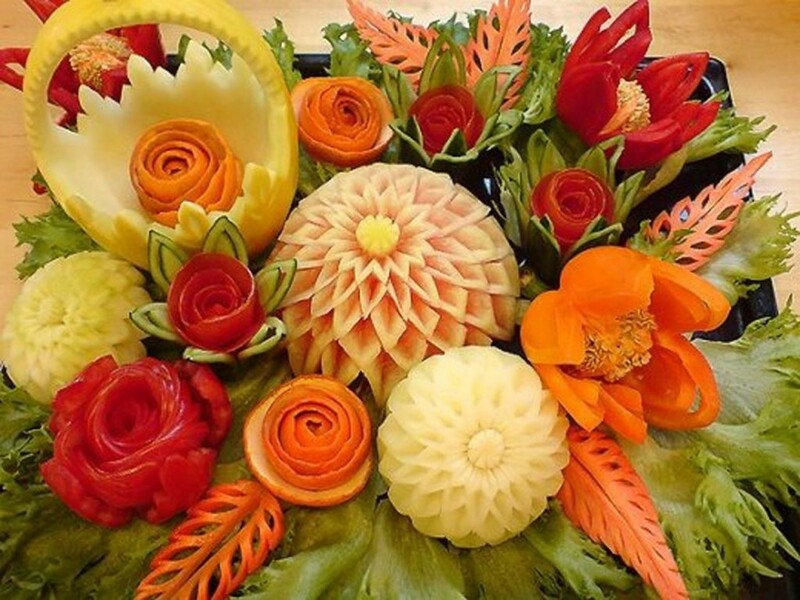 There is a carving institute in Bangkok, Thailand offering edible arrangements for wedding centerpieces and other events with carvings by eminent food stylists in the form of carved fruits and vegetables as beautiful decorations. 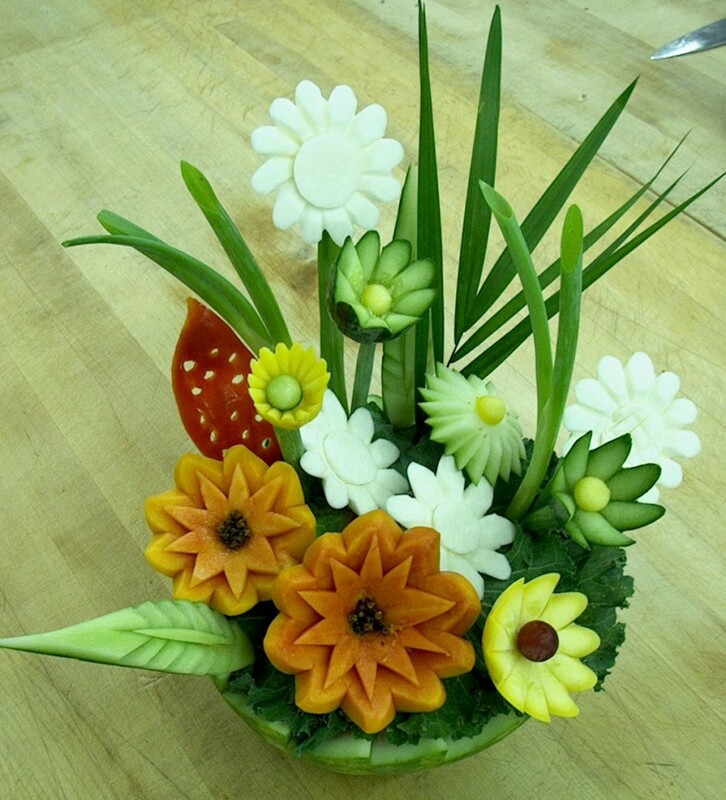 Intricate tools are used in fruit carving. 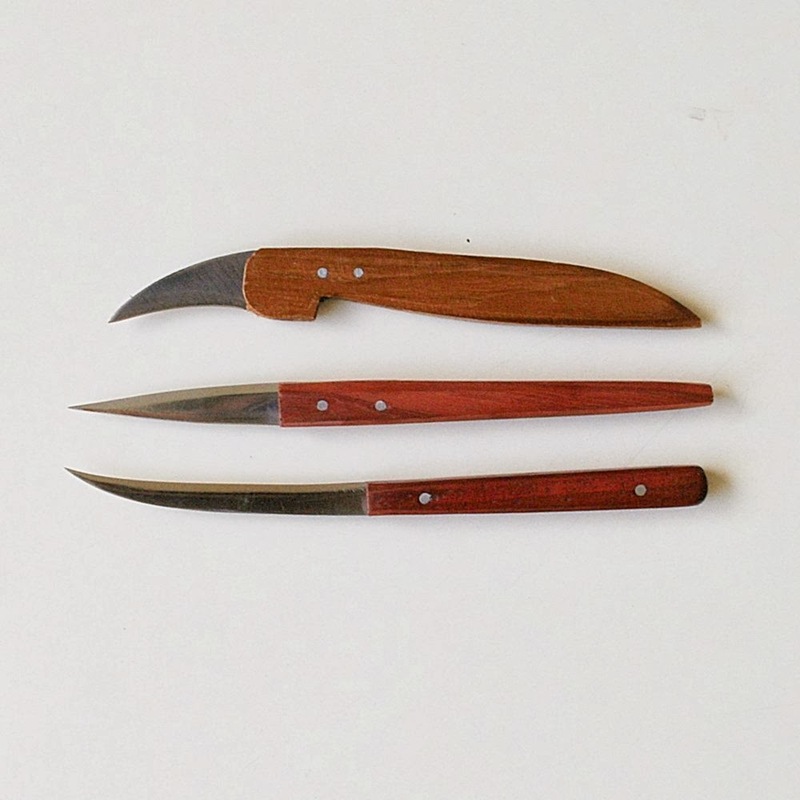 It requires special knives and devices to give the artist a full range of movement while creating complicated flower petals and leaves. It is a tribute to the history of Thai cuisine that a new art was contributed to the world for food presentation. Carving makes food more attractive and appetizing because the taste gets amplified when the presentation becomes elegant. 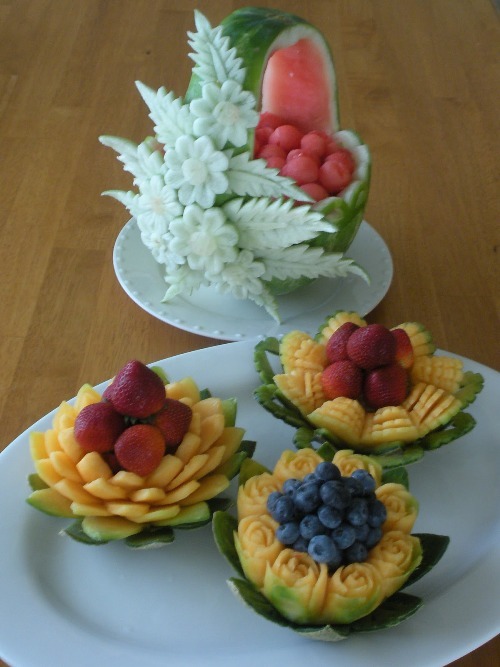 Visiting a good Thai restaurant will give you the opportunity to enjoy the magic of fruit carving from close quarters. You can come across melon and finely carved pineapples into boats and bowls adorning the buffet tables. No human can resist the visual delight of seeing rows and rows of carrots, pumpkins, scallions and radishes transformed into beautiful roses and other creations.